I set myself up with a painting desk at home a couple of weekends ago. Up until now I've been doing all my paintings on the go. The main places I would do the paintings were the AFG, AVAA, various hobo camps, and The Varga's House. So I'm going to be branching out in subject matter now that I have a desk where I can set things down, like reference photos and paint brushes. I should have done it months ago. 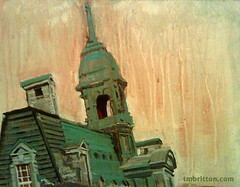 So what I have here is a painting from a photo I took in Montreal. I was there in 2006 I believe for a conceptart.org workshop. I was woefully unprepared as all I had to show off was an embarrassing assemblage of stuff on a dvd from a semester in animation school. I had a sketchbook that was full of awful crap and showing that stuff to pros was fairly humiliating. This was an attempt to get used to painting architectural stuff. I've found the sharpie underdrawing technique works well for this sort of stuff as well as the figure paintings. What I do is make a drawing on the board and thinly paint some general colors over the top. The drawing still shows through so I still have the a guide for the rest of the painting. I then paint more opaquely and cover the drawing. I'm not too concerned with covering the drawing entirely. If you look, you can see it showing through in places. 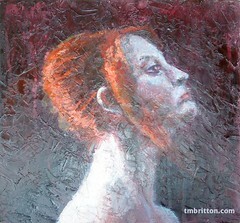 I've got to start experimenting with oil again and see if I can get this working. I figure if I paint the first layer thinned with mineral spirits, I can do the same sort of thing. Acrylic is just currently much easier to handle. Once it dries, you can just paint over the top. Here's my entry to the 12 x 12 art box show that opens on the 5th. It's acrylic and oil. I used acrylic modeling paste to make the texture that's on the surface. It was my hope that it would look like really painterly impastoed brushstrokes. Instead it looks like ceiling plaster in a Quality Inn. But, it's covered in galkyd and shiny. People like shiny. It could be yours for just $100. A little bit of Tom Britton to hang on your wall. It's preferable to a little bit of Tom Britton that won't come out of your upholstery.